The Balaris Apartments are a modern and comfortable complex, ideally situated for families, groups or couples looking to be in a central location, within walking distance of all the resort's amenities and beaches. 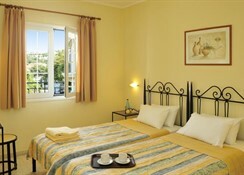 The Balaris Apartments are located close to the centre of the village, approximately five minutesâ€™ walk to the square and ten minutes to the harbour. Newly restored and updated each season, these well-maintained apartments offer comfort as well as convenience.Supermarkets, bakeries, a pharmacy and tourist shops are all conveniently close by as are a varied selection of restaurants and bars. Guests staying at the Balaris apartments have free use of the swimming pool, the children's pool and facilities at the Frosini Gardens apartments which are located opposite. 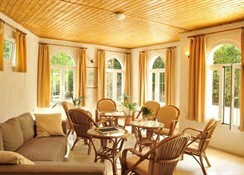 A wise choice of accommodation ensuring a trouble-free, self-catering holiday. The Balaris Apartments will appeal to those looking for modern, relaxing and centrally located accommodation for a memorable holiday in Corfu. Guests are welcome to use the pool and children's pool at the Ariti or Frosini Apartments. The Balaris apartments consist of 8 one bedroom apartments for 2 to 4 people*, all with satellite TV, private bathroom with shower and w.c, hairdryer, fully equipped kitchens and balconies or terraces. All apartments have air conditioning. Three of the apartments are situated on the ground floor and the other five are on the first floor.The private bedroom in each apartment has two smart iron beds, a dressing table and cupboard space, while the lounge/sleeping area has the home comfort of satellite TV. There is a well-equipped kitchen with full size cooker in each apartment and a modern bathroom with WC and shower cubicle. 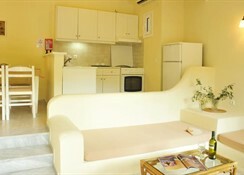 For your convenience there is a hairdryer, iron and ironing board supplied in each apartment. In the cooler months, cosy duvets are available for extra warmth and air-conditioning is installed for respite from the heat during the hot summer months. 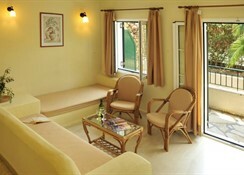 All apartments have private balconies or terraces. Maid service to clean and service your apartment (Arrival day plus twice during the week).Bed linen (Arrival day) and towels (Arrival day and also changed mid week). 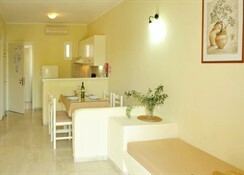 All apartments feature self-catering facilities, which provide a great way of reducing holiday expenses.